“Why We Are Born” – by Akemi G. I hardly know where to begin with this soul filled book! If you are grasping to understand the concepts of “Spirituality”, or have had a gnawing sense you are here for a purpose, or that there is some greater, bigger divine plan – This book is for you! This self published work is the creation of Akemi Gaines – Akashic Record Reader, owner of the Facebook page Akashic Records, and author of several novels. 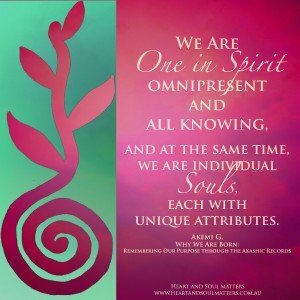 Akemi has simplified complex spiritual concepts, and written them in a language everyone can understand! I am deeply grateful to Akemi for this book. Since reading, I have recommended it to countless clients and friends. For although I have had many conversations on the subject of this book – there is nothing like being able to quietly contemplate the thoughts and feelings that arise when faced with answers to lifelong persistent questions! Take the time to really feel into this book, to acknowledge where it hits you, where it lands within you. There will be aspects of this book you agree with – you will nod and smile, and may even have a deeper sense of peace. There may also be aspects that cause you to react, disagree, rally against – the Ego has a way of rejecting anything that is perceived as a threat to it! By remaining open to possibility, by placing everything in the realm of possibility, we begin to understand our infinite potentiality – Not just ours as the individual, but ours as the collective. What if everything you, we, are experiencing is a call to remember our selves as Love? To exercise our divinity and to actually BE all the Love and wisdom we already are! Everything happens for us. Everything is a blessing. It is either a direct blessing, or a blessing disguised as a lesson. This may seem difficult to digest in the face of tragedy. Yet even tragedy is a call to open our hearts wider, to dig deeper into the well of understanding and wisdom, to find the compassion within. “Why We Are Born” is full of “light” and “love”. Written in Akemi’s trade mark straight forward style it is clear, direct and removes many of the misunderstandings and misconceptions of spiritual teachings. Whether you are just beginning your journey, or well along the path, this book offers insights that will remind you, despite its challenges, just how incredible life is! And just what a gift you are! Please note the links contained within this review take you to the Book Depository of which Julie Parker is an affiliate. This entry was posted in Blog, Soul Books and tagged Personal Growth, Self Discovery, Self Help, Soul, Spirituality on June 16, 2015 by Julie Parker.